Jim has over 27 years of diverse litigation experience with a problem solving focus. In addition to maintaining his litigation practice, Jim helps other litigants resolve their disputes as a mediator or arbitrator. Jim received formal mediator training at the Straus Institute for Dispute Resolution in Malibu, California. He is a shareholder at Durham Jones & Pinegar in Salt Lake City. Jim is sought after for his sound and experienced advice, and practical, fair approach to resolving disputes. Jim served as President of the Utah State Bar in 2014-15, and was a Utah Bar Commissioner from 2008-16. 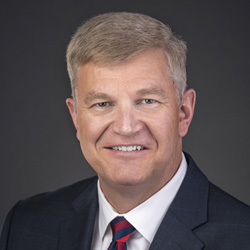 He served as President of the Utah Chapter of the Federal Bar Association in 2000-01, and received the Distinguished Service Award by the FBA’s Utah Chapter in 2014. Jim graduated from the University of Utah College of Law in 1989, where he was an editor of the Utah Law Review. He was a judicial law clerk for U.S. District Judges J. Thomas Greene and Dee Benson, and also was a white collar criminal prosecutor with the U.S. Attorney’s office. Jim has been listed in Utah Business magazine as one of Utah’s “Legal Elite” since 2005, in Mountain States’ “Super Lawyers” since 2008 (on its “Top 100” list in 2016), and is listed in “Best Lawyers in America” in the areas of commercial litigation, intellectual property litigation, and insurance litigation. He has an “AV” rating by Martindale-Hubbell. Discourage litigation. Persuade your neighbors to compromise whenever you can. Point out to them how the nominal winner is often a real loser - in fees, expenses, and waste of time. Harry P. Trueheart, III, Esq. Thomas N. Arnett, Jr., Esq. J. David Nelson, Esq., P.E.